Here's another post from Bill. This time out, he's demonstrating his take on a classic kitchen tool, La Chitarra. Last weekend was the debut performance of my new kitchen tool: La Chitarra. 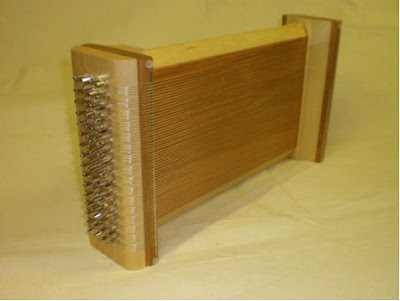 ‘Chitarra’ is Italian for ‘guitar’, but this is not a musical instrument. 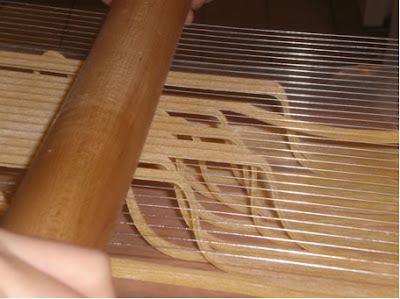 It is an instrument for cutting noodles. I have always been fascinated by my mother’s antique Italian chitarra which has been in the family for many years. Chitarras or ‘Pasta Guitars’ are available commercially from various sources, but I decided to build my own future family heirloom. 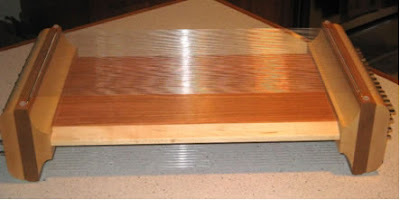 I built a sturdy wooden frame and strung it with 96 strands of piano wire. This chitarra is double-sided. One side is for cutting thin noodles, the other side is for wider noodles. I decided to test out both sides by making a batch of Fettuccini and a batch of Udon. Dump the four on the counter, add the salt and make a well in the center for the eggs. Add the eggs and start mixing. Mix with your fingers at first, then start forming it into a ball with your hands. Add a little water if needed to hold it together. Knead by hand for at least 10 minutes until the dough is smooth and elastic. Let it rest in a plastic bag for at least 2 hours. Udon dough is traditionally kneaded by foot. In an authentic Japanese noodle shop, this is done between sheets of plastic. For a batch this size, a one gallon freezer bag is just about right. Mix the ingredients together in a large bowl. It will be very loose and crumbly at first. Gather the mixture together, mixing in a little extra water if necessary to hold it together. Turn the mixture out on a flat surface and knead by hand until it holds together in a ball. Put the ball into a 1 gallon freezer bag and throw it on the floor. Flatten the dough with your feet. Flip it over a few times and knead until the flattened dough fills the bag. Repeat for 10-15 minutes until the dough is very smooth and elastic. Flatten one last time and let the dough rest for at least 2 hours. Roll out the well-rested dough on a liberally floured surface. Udon dough should be rolled to about 1/8” to make nice fat noodles. For fettuccini, roll the dough as thin as you can make it. Cut the dough into sheets small enough to fit on your chitarra (in this case, 8” x 16”). They will stretch a bit when you cut them, so allow extra room at the ends. Sprinkle the sheets with flour, stack and cover them and set aside to rest for another 30 minutes or more. Wipe the strings of the chitarra with a little oil to prevent sticking. Place a sheet of wax paper under the strings to catch the noodles. 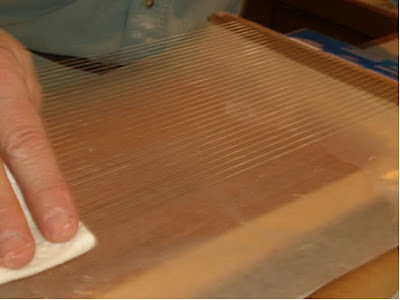 Place a sheet of rolled dough on the strings. 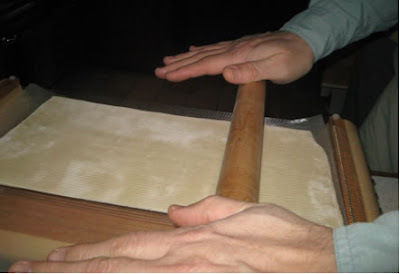 Gently roll with a wooden rolling pin to press the dough between the wires. Increase the pressure until the dough is almost cut through. Then slide the rolling pin back and forth a few times until you can see the shiny wires through the dough. 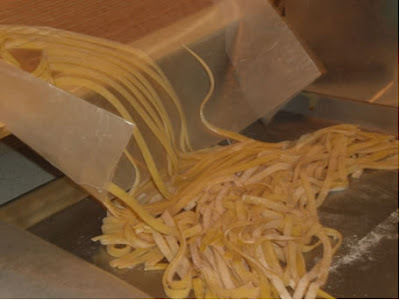 At this point, the cut noodles should start to fall through the wires to the wax-paper below. If they stick, you can help them along by rubbing your hand over the wires. Tip the chitarra to dump out the cut noodles. Clean off any dough stuck to the wires. Wipe with some more oil and repeat until all the noodles are cut. If you are not going to cook them immediately, toss the noodles with some extra flour to keep them from sticking. Wow, a great execution of a great idea. Any thoughts on how the rolled pasta tastes as opposed to extruded pasta?